Can improved Ethiopia-Eritrea relations stabilise the region? After 20 years of hostility, Ethiopia and Eritrea have resumed diplomatic relations. On 8 July Ethiopia’s Prime Minister, Abiy Ahmed, made a landmark visit to Eritrea’s capital Asmara, welcomed by cheering supporters. A week later, Eritrea’s President Isaias Afwerki visited Ethiopia, where he too was greeted by big crowds. But the restart of good relations isn’t important just for these two countries – the entire Horn of Africa region will benefit. Following Eritrea’s separation from Ethiopia in 1991, a border dispute contributed to two years of armed conflict starting in 1998, in which about 100 000 people died. The failure to implement a 2002 ruling over the disputed border led to a situation of ‘no war, no peace’ between the two countries. Despite there being no actual war going on, the armies of both countries have been on standby, and the tension and potential for war has been there. After two decades, the leaders have now agreed to end this situation and forge closer political, economic and social connections. The easing of tensions is already evident – so far telecom services between the two have resumed; Ethiopian Airlines is starting regular flights to Asmara; and Eritrea has reopened its embassy in Addis Ababa. 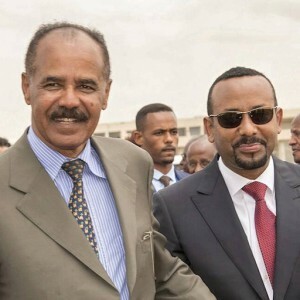 The Ethiopia-Eritrea conflict has been one of the major reasons for instability in the Horn of Africa, and so the effects of their rapprochement will be felt across the region. The proxy warfare policy they’ve pursued beyond the boundary issue – both in each other’s territory and in far-flung areas of the Horn – has contributed to regional insecurity. In their recent declaration, the leaders have included an agreement on ensuring regional peace, development and cooperation. Rebel movements based in both countries under the ‘enemy of my enemy is my friend’ principle have sprung up over the years. Incidents involving armed groups trying to cross into Ethiopia from Eritrea – with authorities accusing the Eritrean government of supporting them – have contributed to tensions. One of the most significant recent incidents was an attempt by armed groups to attack the Grand Ethiopian Renaissance Dam, a major symbol of Ethiopia’s ambitions and infrastructural prowess. The attackers were reportedly from Eritrea. Similar patterns emerged elsewhere in the country, showing how the ruptured relations destabilised other parts of the Horn. Eritrea was accused of supporting ‘terrorist’ groups like al-Shabaab in Somalia from the early 2000s. This resulted in the border dispute being contested in a third destination, Somalia – contributing to the cycle of conflict in the region. The resumption of relations between Ethiopia and Eritrea will mean more stability for the whole region. There has already been talk of readmitting Eritrea into the Intergovernmental Authority on Development (IGAD). Such an outcome would begin its reintegration into the wider region, and lessen its global isolation. Nevertheless, the new situation may also create a dilemma for countries that benefited from the previous status quo – for example Djibouti. Following the border war, landlocked Ethiopia moved the main seaport for its imports and exports from Eritrea to Djibouti, which currently accounts for about 90% of Ethiopia’s port traffic. Ethiopia pays Djibouti about US$1.5 billion for port services annually. Djibouti’s position could come under threat if Ethiopia starts using Eritrean ports. Djibouti was anyway unlikely to maintain its near monopoly on Ethiopia’s import/export traffic – one port for a rapidly developing country with a population of over a million isn’t enough. And Ethiopia had already been looking to diversify its port access. In Djibouti’s favour, however, is that its port infrastructure remains more developed than any of Ethiopia’s other options. Also, the newly inaugurated Ethio-Djibouti railway ensures a steady logistical connection; and Ethiopia may take a stake in Djibouti’s main port. While the impact on port traffic is unclear, the renewed relations could benefit Djibouti as it too has an unresolved border dispute with Eritrea. As both countries now maintain good relations with Ethiopia, there may be an opportunity to engage to resolve this peacefully. Sudan is also probably watching the developments closely. It has oscillated between aligning itself with Ethiopia and Eritrea and its relations with both countries are at times complicated. Lately, however, Sudan has sided more with Ethiopia, and in January it closed its border with Eritrea and deployed troops nearby. Eritrea responded by accusing Sudan of supporting anti-Asmara rebel movements. As with Djibouti, however, improved relations between Ethiopia and Eritrea could eventually reduce the potential threat along the Sudanese border, especially if Eritrea is readmitted into IGAD and starts contributing towards regional stabilisation through greater integration. So while the resumption of good relations between Ethiopia and Eritrea is positive for both countries, the impact will be felt throughout the region. Hopefully the improved relations will end the cycle of both direct and proxy conflicts that have afflicted the Horn of Africa for far too long.